Use your hands as an “Artificial heart lung machine” : The greatness of hands only CPR ! Cardiopulmonary resuscitation (CPR) is the major discovery of last century that has saved many lives over the years. In spite of this , there has been lot of debate over the exact methodology adopted .The much published techniques of Basic cardaic life support (BCLS) which is in vogue for over 2 decades has failed to deliver the results as one would have expected. Many of the potential resuscitators preferred to become silent spectators ! The world bodies ACC/AHA/ILCOR has been watching this evolving pattern and behaviour . Mean while when we looked into the data of survivors of cardiac resuscitation , we realised even an improper and inadequate CPR had some positive effect on survival . How was this possible ? There have been innumerable instances of individual and institutional reports about many lives that have been saved simply by compressing the chest after cardiac arrest or at least kept the person alive and breathing to be taken for advanced cardiac life support. The outcome of chest compressions without ventilations is significantly better than the outcome of no CPR for adult cardiac arrest.In surveys healthcare providers well as lay rescuers were reluctant to perform mouth-to-mouth ventilation for unknown victims of cardiac arrest. In observational studies of adults with cardiac arrest treated by lay rescuers, survival rates were better with chest compressions only than with no CPR but were best with compressions and ventilation . Some animal studies and extrapolation from clinical evidence suggest that rescue breathing is not essential during the first 5 minutes of adult CPR . Laypersons should be encouraged to do compression-only CPR if they are unable or unwilling to provide rescue breaths . In this world of hi tech life support devices like LV assist systems, implantable defibrillators robotic surgery , it is heartening to note a pair of human hands can save a human life or at least sustain a life till the advanced emergency service reach the patient. The fact that hands can act as a artificial heart lung machine at least for few minutes could be the greatest invention for the mankind by the mankind. Under ideal conditions both chest compression , proper airway , and assisted breathing is always better than simple chest compression .This blog wants to convey the point chest compression alone could also be a effective CPR measure . Click below to read the article . Why inferior MI is considered “Inferior” ? Myocardial infarction (STEMI) occurs in two distinct arterial territories .The anterior LAD circulation and postero- inferior RCA/LCX circulation.The incidence is equally shared. There has been some learned and unlearned perceptions about Inferior MI. Inferior MI is less dangerous than anterior MI. True or false ? Answer: Essentially true in most situations. Apart from the above anatomical considerations the following clinical observations have been made regarding inferior MI. When thrombolysis was introduced , many studies suggested the the ST elevation in inferior leads toched the isolectric levels in most situations even without thrombolysis.Technically, this implies spontaneous , successful thrombolysis are more common in RCA. Among the thrombolysed ,persistent ST elvation is a rare phenomenon. Even in the follow up the ejection fraction in inferior MI is almost always above 40%. In many EF is not affected at all. When can Inferior MI be dangerous ? Inspite of the above factors inferior MI can not be taken lightly . Especially when it extend into posterior, lateral , (Rarely anterior) segments. While posterior extension is often tolerated , lateral extension is very poorly tolerated .This is probably explained as the extension involves the vital free wall of LV and the laplace forces could precipitate LVF. Free wall rupture is also common in this situation. Posterior extension , predominantly involves the surface of RV which is less important hemodynamically. Of course incidence of MR due to it’s effect on posterior mitral leaflet can be trouble some. Out of hospital STEMI are at equal risk irrespective of the territories involved .This is because, primary VF does not differentiate , whether ischemia comes from RCA or LAD . In elderly , dibetics and co existing medical condtions the the established benign character of inferior MI disappear, as any muscle loss in LV has equally adverse outcome. Even though inferior MIs are immune to cardiogenic shock , a equally worrisome prolonged hypotension due to high vagal tone, bradycardia, plus or minus RVMI can create trouble. Fortunately , they respond better to treatment. Except a few with extensive transmural RVMI outcome is good. Presence of mechanical complications of ventricular septal rupture , ischemic MR can bring the mortality on par with large anterior MI. How different is the clinical outcome of infero-posterior MI with reference to the site of coronary arterial obstruction ? ** A inferior MI due to a dominant LCX and a large OMs have comparable outcome as that of extensive anterior MI. The ECG will reveal ST elevation in both inferior and lateral leads. ***In patients with prior CAD and collateral dependent multivessel disease the inferior anterior sub classification does not make much sense as entire coronary circulation can be mutually interdependent. Inferior STEMI generally lacks the vigor to cause extensive damage to myocardium in most situations .Further they respond better to treatment. Risk stratification of STEMI based on the location of MI has not been popular among mainstream cardiologists. This issue needs some introspection as the costly and complex treatment modalities like primary PCI is unwarranted in most of the low risk inferior MIs. 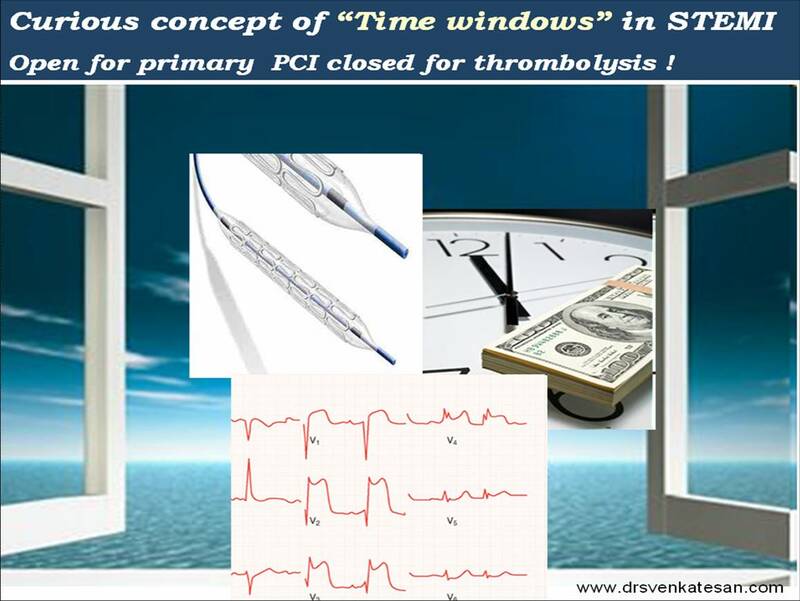 1.Why thrombolysis is more effective in RCA? What is the incidence of insignificant left main disese ? How will you manage it ? Left main coronary artery disease (LMCAD) often evokes a panic reaction among cardiologists .Not every LMD deserve that re. To label it as significant, we have a criteria , that is 50% diameter stenosis. So what you do , for a tapering or narrowed left main with 40% stenosis. Isolated insignificant left main is rare *, but real incidence is not known. LMCAD is most often due to , atherosclerosis of left main coronary artery without limiting the flow. Elective PCI with stenting , even though the lesion is not significant. *If associated LAD or LCX is there decision making is easier . How significant is a coronary stenosis ? The significance of a coronary lesion with reference to “lumen diameter obstruction” is basically flawed. The significance of a coronary stenosis, by tradition is based on it’s hemodynamic impact ,right from the CASS days in early seventies.Unfortunately our mind set has not changed even after realising non obstructive – sub critical lesion is more prone for acute coronary syndrome. Is it not ironical to call a 40% lesion a non significant one ! So, the significance of coronary stenosis is two fold. The former predisposes to often chronic stable angina, later likely to result in ACS. How will you approach a apparently insignificant left main disease ? A 40 % lesion in left main is hemodynamically not significant , but pathologically very significant.It needs intensive treatment. Plaque passification with medical approach is first choice.If the lesion morphology is eccentric, has irregular margins or involves LAD or LCX ostium doing a PCI or even a CABG is to be considered in spite of the lesion is hemodynamically insignificant . Why , PCI is considered “not appropriate” for less tighter lesions , even though these lesions have great clinical significance ? The answer is simple, The risks and the potential cost are more than the benefit ! And further , stents are not innocuous devices either , they always carry a risk of sudden occlusion as like a sub critical lesion !